Just across from the cottage, off Coronation square, is the church of All Saints. 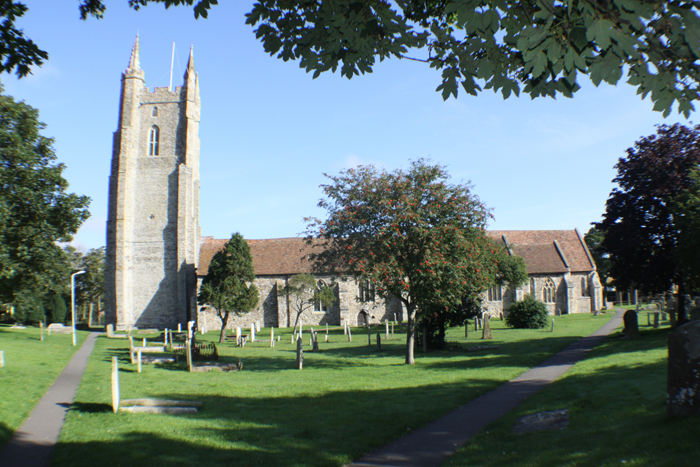 It was built in the thirteenth century when Lydd was at the height of its prosperity. It is the longest church in Kent – at 199ft it is of cathedral sized proportions and is therefore distinguished as the “Cathedral of the Marsh”. In the north-west corner, the remains of a small fourth or fifth century Romano British or Saxon basilica has been taken into the thirteenth century church, which establishes Lydd’s existence as before 740 AD and makes this the oldest masonry on the Marsh. In the north-east chapel there is a fourteenth century tomb with the sculpted figure of a recumbent knight. In 1940 the chancel of the church was destroyed by a direct hit from a bomb; the attack occurred at 4:07 PM on the 15th of October, which is when the church clock stopped. Additional bombing attacks in 1944 caused further damage, and painstaking repairs were made using the original bricks. Thus the masonry at Lydd spans a period of over 1500 years. The church’s impressive graveyard features the final resting places of Lt. Thomas Edgar, who was Captain Cook’s companion on his round-the-world voyage, and Samuel Finn, who commanded the battery at Dungeness in the early 19th century. Many smugglers’ graves can be found here as well. On Sunday mornings visitors to the cottage will be awaken by the Call to worship chimes from the bell tower – constructed by Thomas Stanley, a senior mason at Canterbury Cathedral, between 1442 and 1446. You can also enjoy the bells on one evening of the week when the bellringers practice. This entry was posted in Churches on May 28, 2015 by admin.